My list of 9 habits of “Highly Successful MD Cosmetic Injectors.” I’ve spent the last few months hovering around internationally renown MD Cosmetic Injectors. I participated at a Palette Injectors meeting / training for Level III injectors in Sacramento, and I also at the 2013 Vegas Cosmetic Surgery Meeting. This is my partial collection of empty Botox bottles. Here are some success habits I think these great injectors have in common. 2. They are constantly looking for newer and better ways to do things. 3. They are eager to explore new products. 4. They selectively use cannulas for some of their injections. 5. They are very willing to share / talk / publish. 6. They make injections a priority in their practice. 7. They often go back to basics which includes knowing the anatomy, and exploring new anatomical concepts. 8. They are not be afraid to show off their grey hair – but will make some attempt to hide their wrinkles. 9. Most importantly they do not view fillers or Botox as a COMMODITY. In other words, it’s not a Botox per unit price or cost per syringe of Juvederm (the PRODUCTS), rather it’s the injector’s SKILL which is the true value. And this is how they provide the best VALUE – through the best skill and materials. There are also a great number of amazing Nurse and Physician Assistant injectors. I haven’t had the opportunity to attend sessions and lectures by them (yet – I’d like to see what makes them successful as well, so it’s on my list). All the lectures and meetings and demonstrations that I’ve attended in the past few months were by Surgeons and Dermatologists. This entry was posted in Botox, dermatology, Education, Fillers, Juvederm, Plastic Surgery and tagged botox, cannulas, dermatologists, injectors, Modesto on July 28, 2013 by Calvin Lee, MD. To start with, how about a picture of these cannulas? Why the need for Cannulas in comsetic filler injections? You might say that Juvederm, Restylane, Radiesse, Belotero, Perlane, Prevelle injections have been just fine with a plain needle. But why increase the difficulty of the procedure? The reason? Less bruising? Smoother results? Safer? Those are excellent reasons for having your injector / surgeon work harder. Fillers are like they sound – they fill spaces up to replace volume that we’ve lost as we’ve aged. Familiar fillers are Juvederm, Restylane, Perlane, and Radiesse. There are many more brands of cosmetic injectible filler implants. However these are some of the common ones used in my Modesto office: Surgical Artistry. Botox isn’t a filler – Botox relaxes muscles. Here’s a link to my page: Anatomy for Botox. Both fillers and Botox are used for facial rejuvenation. Why the opening on the side of a cannula? The opening is on the side for extrusion of the filler such as Juvederm so that the tip can be made in a blunt fashion. If the opening was at the tip, there would be sharp ends. Thus the opening is on the side. Is this good or bad? It’s both. It’s good because now the tip can be blunt. It’s bad because we lose a bit of the precision which we were used to with the tip of a regular needle. Why the blunt tip on the cannula? This is the key ingredient for safety and less bruising. Because the tip is blunt, it won’t easily go through vital structures such as arteries, veins and nerves. It glides through fat. In fact this blunt tip cannula idea is used in surgical liposuction. The safety is in the prevention of cutting vital structures. The less bruising is because there’s less internal bleeding due to the cutting of blood vessels. Yes, the difficulty is increased and it feels more like a complex procedure. However, the risks diminish and many of the positive results increase – including patient satisfaction, smoother results, and less downtime. I think this is worth the increased time and complexity – something surgeons think about all the time. Needle vs blunt-tipped micro cannula. Safety is the #1 reason I like cannulas. Where can cannulas be used? Lateral Eye Brow fat pad area – helps to raise the eye brows too. Why are cannulas more difficult? There’s a need to use a pilot needle (which can still cause a bruise) to create the opening in the skin for the cannulas to slide through. Cannulas are flexible and there can be physical hang ups (getting stuck), and difficulty driving the cannulas from a distance (longer needle). And because they are flexible, sometimes they are harder to feel their presence under the skin. The hole is on the side of the needle not in the front. What’s the main reward for using a cannula? Patient safety. When a blunt tipped cannula is used well by an experienced injector, there is much higher patient safety. Using needles – one could puncture subcutaneous structures which would otherwise like to stay unpunctured. What are other great benefits of using cannulas? Tip is blunt – actually might hurt less. Tip is blunt – won’t injure as much under the skin such as blood vessels and nerves. Less bruising – because there’s fewer injury to blood vessels and thus less internal bleeding. Less swelling – for reason above. Flexible cannula – allows for safety – the cannula moves or wiggles around some of the stiffer structures within the fatty tissue planes. Longer length – thus fewer skin puncture sites. There’s also the benefit of calling this instrument a cannula rather than a needle – less scary sounding. What is my favorite cannula? Cannulas come in many different styles and lengths. I currently use Magic Needle and Dermasculpt cannulas. I haven’t had the chance to try other cannulas on the market. I believe they would be excellent. The Magic Needle cannuals are more flexible – perhaps a little bit too flexible for my current tastes. I know my tastes will change with time – it has before – I remain flexible myself in my choices of cannulas. As for favorite size/length of cannulas. I like the 27g 1.5 inch cannulas for most of my Juvederm injecting. I use this cannula mostly for temples and cheek augmentation. Do I think that cannulas are game changers in the world of injectable fillers? I think so. For the sake of patient safety and smoother appearances. Plus with the added benefits of shorter recovery period (less bruising, less swelling). No. There’s a role for each tool. These are my thoughts (Calvin Lee). No specific medical information here. This entry was posted in cannulas, dermatology, Fillers, Juvederm, Lip Augmentation, Modesto, Plastic Surgery, Veins and tagged downtime, microcannulas, safety on July 21, 2013 by Calvin Lee, MD. I perform lip augmentation with fillers such as Restylane and Juvederm ultra. 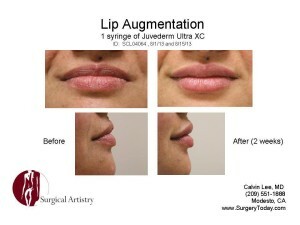 I have occasionally used Juvederm Ultra plus for more dramating lip augmentation effects. This write-up serves it’s purpose for me to put down on paper some thoughts flying around my head regarding excellent lip augmentation. My thoughts on Cannulas for Lip Augmentation. Much of the info here is considered off-label FDA usage. Nothing here is meant to be personalized medical advice – just a generalized discussion here. The procedure is done in my office in Modesto, CA. There is no IV sedation or pill sedation or general anesthesia. There are options of numbing cream, ice, nerve blocks, mucosal blocks, and lidocaine within the product. Some lip augmentation patients choose all these options so that they feel pretty close to no pain. Some patients just choose just one of these numbing options as each one does take time and patients at the office visit. Demonstration of Lip Augmentation with Juvederm, posted with permission from my patient. There are several parts of the lip to consider. First is the ratio of the upper lip tot he lower lip. Most patients like their lower lip on the larger side. Then there’s the part around the lip which needs to be considered. With some extra support of the white areas around the lips – this area can use a half to whole syringe just to expand out the fine line around the lips. Volume loss has occured here. Take all these into consideration, then there’s the best part – augmenting the red part of the lip. injecting near and at the wet-dry border of the lip to create more vertical curl of the lips. I’ve come up with these thoughts as I’ve gained more and more experience via lips. How many syringes of fillers needed for the lips? considering the three locations for injecting into the lip and the white part of the lip. One could use 2-3 syringes of Juvederm or Restylane for the project already. However 1 syringe of Juvederm or Restylane has been the choice of many due to cost concerns and also 1 syringe does a wonderful job for many lips, and not everyone wants all aspects of the lips (definition, fullness, and curl plus the perioral lip lines) to be changed. So quick answer: Most of the time just one syringe of filler. But this is a start. I wrote down this information mainly for myself to help organize my thoughts on the topic of Lip Augmentation. A personal consultation regarding lip augmentation would reveal specific personalized information which would be much more useful than this article. There are many options available for lip augmentation. I normally choose products which can be reversed and also are precise in the results which we are looking for. Many patients consider getting lip filler placement ever 4-8 months. Permanent lip implant options exist. Perhaps we’ll explore those in the future. For now, we’ve taken out several of these done by others. I do think that there is a role in the overall lip enhancement world for these permanent products, but I’ve been personally very happy with hyaluronic acid type fillers for the lips such as Juvederm and Restylane. What makes Lip Augmentation so difficult? Lip augmentation is somewhat challenging. But as surgeons we usually like challenges and are very satisfied to get great results. Patient expectations – what is the patient’s definition of duck lips – do they want to avoid that? Lip symmetry – this is a big importance between left and right sides. Many patients are not symmetrical to begin with. Lip bruising afterwards – this does happen and is a risk of the procedure. I think it happens a lot more often than not. Lip area tends to have more pain fibers and thus there’s the challenges and difficulties of achieving comfort for the patient. Everyone is different when it comes to pain sensation. But almost everyone would agree that lips are particularly more sensitive. But we have options to include performing nerve blocks – like going to the dentist. Lip lines around the lips should be addressed too. The issues of infections around the lip. The lips are one the least “sterile” areas of the face to work on. And some patients even have the challenges of cold sores. We try to anticipate these problems and have prescriptions available at the office for Acyclovir – a drug that helps to shorten the length of active cold sores. Desired ratio between upper lip and lower lip. Some lips can’t take too much product all at once and a staged procedure might have to be done. We don’t want complications of lip necrosis (dying off). Another interesting challenge: When doing fillers on the lips we have to deal with the location of the previous fillers done months ago. Not all of it disappears and we have to be able to work with the previous filler to blend it all together and not allow the old filler to get in the way of the new filler. For me, sometimes this is the biggest challenge, especially if the previous techniques used for lip augmentation are different from what I’m expecting. This list goes on and on, but I wanted to list a few challenges which I have on my mind when going through the process of lip augmentation. 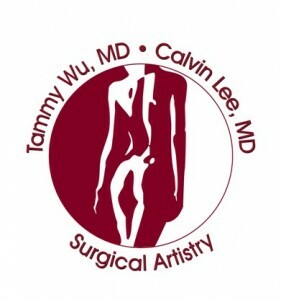 Dr. Tammy Wu also does lip augmentation, and in addition she also removes permanent lip implants, lip reduction, mucosal reduction, and lip reconstructive surgeries. But for the most part if on is interested in lip augmentation with injected fillers, Dr. Calvin Lee (me) is in charge of that part of the minimally invasive facial injections. Lip augmentation is one of the most satisfying procedures that I have. This entry was posted in Cosmetic Surgery, dermatology, Fillers, Juvederm, Lip Augmentation, Modesto and tagged lip filler, permanent, temporary on July 16, 2013 by Calvin Lee, MD.